The vineyards of this small appellation in the Savoie region of France are regularly mentioned in documents dating back to at least the 11th century. The sparkling wines of Seyssel are produced according to the same méthode traditionnelle techniques used in Champagne. 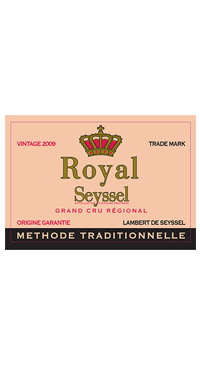 Lambert de Seyssel ages the Royal Seyssel for at least three years before disgorging it, giving the wine complex aromas and a fine perlage that makes it stand apart from its regional competitors, which are legally only required to age the wine for a minimum of nine months. The wine also has a low dosage making it a drier style and preserving the character of the grape varieties. This is a vintage traditional method sparkling wine; a blend of 50% Altesse and 50% Molette from 20-50 year old wines. A liqueur de tirage is added to launch the second (sparkling) fermentation and the bottles are stocked sur latte for three to four years. The dosage is 10.7 g/L, a little less than the Lambert Seysell Petit Royal which is 12g/L.